•History and Symptoms - we first discuss any problems you might have with your eyesight and general health as many eye conditions are health-related. We also discuss your work and leisure activities to assess your visual needs. •Eyewear Assessment - if you already wear glasses or contact lenses, we check them to see if they are suitable for your vision. •Refraction - this part of your examination finds out whether you need optical lenses to correct your eyesight. We test your near vision (for reading), your distance vision (for driving, TV), and your intermediate vision (for hobbies or computer work). 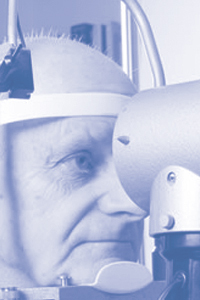 •Oculomotor Balance - we check that your eye muscles are co-ordinated and you have comfortable vision at all distances. •Pupil Reflexes - an unusual pupil reflex may indicate neurological problems, so we must check that your pupils react normally to certain stimuli. •Intraocular Pressure - too much pressure inside your eyes can indicate glaucoma, a disease which eventually leads to blindness if left untreated. This test is usually only carried out on people over 40 or those with glaucoma in the family. •Visual Field Test - losing your field of vision is one of the main signs of glaucoma, so where appropriate we check your all-round vision and your peripheral eyesight. •Ophthalmoscopy - this is a very important part because it evaluates the health of your eyes. Conditions such as diabetes, cataracts, hypertension and macular degeneration can be detected and monitored by an eye examination. Finally we give you an explanation of your vision and eye health, plus a copy of your optical prescription. Children should have their first eye examination before starting school. It does not matter if a child is too young to talk or read a letter chart. Our practise uses a wide range of techniques and modern equipment to detect visual problems at an early age. We stock a wide range of frames specially designed for young faces many can be supplied free on the NHS - with other frames available at very attractive prices. Many have soft nose pads for extra comfort and spring hinges to stand up to the rough and tumble of everyday life.